Students are placed at the appropriate level into either Course 1 (Math 6), Course 2 (Math 7), Gateways (Intensified Math 7) as determined by 5th grade SOL scores, the Arlington County test given at the beginning of the year, and the 5th grade teacher recommendation. Instruction occurs in a setting where a differentiated curriculum is encouraged and implemented. Students who need extra help in math receive support through the math skills program and a tutorial system involving upper class students. Students are often regrouped during the school year depending on their needs and progress. See page 18 for individual math course descriptions. 8th grade students are placed in the following courses based on their performance in their 7th grade math class. This course includes challenges in number sense showing the theory and logic behind the use of basic skills such as calculating with decimals and percents. Problem solving is an integral part of each lesson and presents opportunities for the students to work cooperative. Activities such as Problem of the Day and projects help students to appreciate the connection that math has to their world. The math program addresses the objectives of Virginias Standard of Learning. This course incorporates problem solving with mathematics skills and additional material such as proportions, percents, mental math techniques, probability, geometry, coordinate geometry and algebraic symbol manipulation. Students incorporate problem solving with various mathematical topics such as Algebra, Geometry, Statistics, Data Analysis, and more. The course may entail contract work, cooperative group work and research, as well as independent work. Gateways is an integrated approach to algebra and geometry. It takes mathematical concepts from various areas to combine and spiral them through the course. It is an intensified mathematics program and designed for the abstract thinker. This course includes properties of the real number system, operations with exponents and polynomials, first-degree equations and inequalities, problem solving, factoring, algebraic fractions, fractional equations, radicals, quadratic equations, and graphing in the coordinate plane. Prerequisite: Teacher recommendation. Math assignments will be made in the spring. This is a more intense and in-depth course for highly motivated students. Prerequisite: Grade of “B” or better in Algebra I, Intensified or Grade “A” in high school Algebra I, or teacher recommendation. Intensified geometry is a rigorous study of logical reasoning through the use of plane and solid figures and the concepts of Algebra I. The student is expected to demonstrate deductive thinking within a postulational system by constructing original direct, indirect, and coordinate proofs. This course is designed for students who intend to continue in the Advanced Placement Program. Since our classes are taught in scheduling blocks which meet 4 times a week, students generally will find that homework is somewhat longer than if they met 5 times a week as at other high schools. As a result of the extra emphasis placed on out-of-class assignments in our curriculum, the mathematics staff recognizes the need to provide help outside of class either on an informal basis or, in some cases, in the form of scheduled lab periods. Independent study for mathematics courses is an option. Requests are granted by the individual math teacher who teaches the course. Independent study relies on the ability of the student to complete the work independently. We offer 3 separate mathematics course sequences, although students are free to move back and forth among them as circumstances, interests, and abilities dictate. The slower paced sequence is designed for students who need additional time and more drill to maintain and strengthen their skills. The advanced sequence of courses corresponds to the regular sequence but the instruction is much more concentrated. Extra topics are introduced, the pace of instruction is faster, and concepts are treated in more depth. This course is the standard beginning course in the algebraic process, a more abstract treatment of numbers and reasoning than is covered in pre-algebra mathematics. It includes properties of the real number system, operations with exponents and polynomials, first-degree equations and inequalities, linear equations, solving systems of linear equations, factoring, algebraic fractions, fractional equations, radicals, quadratic equations, and graphing in the coordinate plane. This is a more intense and in-depth course for the highly motivated student. It covers the same basic objectives as Algebra I, but in more depth. There are also a few additional topics including matrices and statistics. Prerequisite: Grade of “C” or better in the previous mathematics course & teacher recommendation. This course is intended to satisfy the needs of the student who desires a course in algebra but who needs more review of previous math topics and will benefit from two years of instruction to complete the sequence. Emphasis is placed on strengthening basic computational skills. For the successful completion of Part I, the student receives one unit of (elective) mathematics credit. Completion of Algebra I, Part II (317) is required to complete the required Algebra I level mathematics credit. Prerequisite: Grade of “C” or better in Algebra I, Part I. This is the second year of the two-part course. The course covers a review of the concepts presented in Algebra I, Part I as well as the real number system, operations with exponents and polynomials, first-degree equations and inequalities, solving systems of linear equations, factoring, radicals and quadratic equations, and graphing in the coordinate plane. These topics are covered in less depth than in Algebra I but are intended to meet SOL requirements. For the successful completion of Part II, the student receives 1 unit of required Algebra I mathematics credit. Completion of both Part I (316) and Part II (317) counts as two required math credits at the Algebra I level for both the Standard and Advanced Studies diplomas. Prerequisite: Grade of “C” or better in Algebra I or “B” or better in Algebra I, Part II. Geometry involves the student in the study of mathematical structure through the use of deductive reasoning and the application of proof. This course covers the concepts of congruence, parallelism, similarity, and perpendicularity, as well as the properties of circles, polygons, and solids. Algebraic concepts are reviewed and applied to coordinate geometry. Prerequisite: Grade of “B” or better in 8th grade Intensified Algebra or Grade of “A” in high school Algebra I, or teacher recommendation. Intensified geometry is a rigorous study of logical reasoning through the use of plane and solid figures and the concepts of Algebra I. The student is expected to demonstrate deductive thinking by constructing original direct, indirect, and coordinate proofs. This course is designed for students who intend to continue in the Advanced Placement Program. Prerequisite: Grade of “C” or better in Algebra I or Algebra I, Part II, or a passing grade in Algebra I or Algebra I, Part II, if student has completed the course a second time. Principles of Geometry is a course designed to enable the student to view geometry through applications. The unity of mathematics is demonstrated through the appropriate use of algebra in developing geometric principles. Such topics as angles, congruence, similarity, parallels, triangles, quadrilaterals, and circles are included. The requirements, with respect to deductive proof, are less demanding than those of regular geometry. Prerequisite: Grade of “C” or better in Algebra I and Geometry. This course is an extension of Algebra I and Geometry. Study of number of properties is extended to include complex numbers. Systems of equations containing two and three variables are solved graphically, algebraically, and with matrices. The function concept is studied in depth including linear functions, polynomial functions, power functions, and rational functions. Sequences and series and conic sections are explored. Trigonometry is not covered in this course, but a foundation is set for its study in Pre-calculus. Prerequisite: Grade of “B” or better in Intensified Geometry or teacher recommendation; or “A” in both Algebra I and Geometry or teacher recommendation. In addition to a more in-depth study of the content found in the description of Algebra, some of the following topics may be included: logarithmic and exponential functions, additional applications of matrices and determinants, and introductory trigonometry. Prerequisite: Grade of “C”or better in Algebra I or Algebra I, Part II and a passing grade or better in Geometry or Principles of Geometry. Algebra II is an extension of Algebra I and Geometry and includes a study of linear, quadratic, logarithmic, and exponential functions and their graphs. The study of systems of equations and inequalities sequences and series, properties of complex numbers, and basic analytic geometry of conics are included. The requirements of the course are less rigorous than those of regular Algebra II, but are intended to meet SOL requirements. This a Precalculus course completes work with elementary functions, namely the polynomial, linear, exponential and logarithmic functions. Particular attention is given to the general properties of functions, function notation, and the graphing of functions. Approximately half the year is spent in an in-depth study of trigonometry, including trigonometry equations, identities, Laws of Sines and Cosines, vectors and other applications. Basic limits and derivatives are covered to begin work in Calculus. Other major areas deal with the elements of analytic geometry, including conic sections. Prerequisite: Grade of “B” or better in Advanced Algebra II or teacher recommendation; or “A” in Math Analysis/Trig or teacher recommendation. Prerequisite: Grade of “B” or better in Algebra II, Principles or “C” or better in Algebra II. This course is an alternative to Precalculus that specifically covers trigonometric topics as well as continuing more depth in many algebraic topics, but with less rigor than in Precalculus. Students may move into Calculus AB if they demonstrate strong mastery in this course. Prerequisite: Grade of “C” or better in Advanced Precalculus or “B” or better in Precalculus or teacher recommendation. 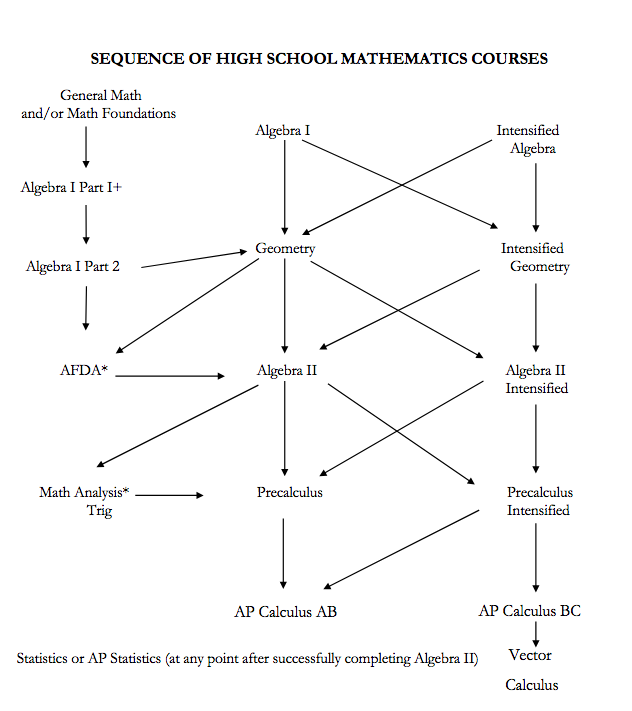 Students may not skip Precalculus and go from Algebra II directory to Calculus. This course is college-level differential and integral calculus and follows closely the outline prescribed by the College Board. The course covers the material included in most first semester college calculus courses and thus, students who achieve a satisfactory score on the Advanced Placement exam will receive college credit for one semester of college calculus (depending on requirements of each college). Prerequisite: Grade of “C” or better in Advanced Precalculus or “B” or better in Precalculus or teacher recommendation. Students may not skip Precalculus and go from Algebra II directly to Calculus. This course is college-level differential and integral calculus and follows closely the outline prescribed by the College Board. The course covers the material included in most first and second semester college calculus courses and thus students who achieve a satisfactory score on the Advanced Placement exam will receive college credit for one year (2 semesters ) of college calculus (depending on requirements of each college). *Note on AP Calculus (AB or BC): Students who have completed AP Calculus BC as juniors may take Multivariable Calculus as seniors or a mathematics class at a local college. A student who has taken AP Calculus AB as a junior may opt to take AP Calculus BC as a senior, but he/she will not receive a second calculus credit. The higher course will be reflected on his/her transcript. Multivariable Calculus is offered for those students who have completed AP Calculus BC. It is the course that follows BC Calculus in the college sequence. The course will cover the standard topics of the college course. Some of these topics are: vectors and the geometry of space, vector valued functions, functions of several variables, partial differentiation, multiple integrals, and vector analysis.